This is a classic favourite that everyone loves. 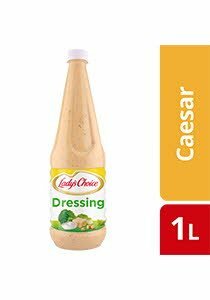 Lady’s Choice Caesar Dressing is made with anchovy, eggs and finished with a hint of traditional spice. Ideal for salads, wraps and burgers. Water, Soybean Oil, Sugar, Vinegar, Eggs, Iodized Salt, Spices, Modified Food Starch, Anchovy, Preservatives (Sodium Benzoate, Potassium Sorbate), Stabilizer (Xanthan Gum), Cheese Powder, Artificial Flavour, Artificial Colours [Yellow 5 (Tartrazine), Yellow 6]. Calcium Discosium Edta Added To Protect Flavour.